The services\products of Burrowes Consulting and Cemetery Mapping Services are the result a 45 year computing career with a 45 year cemetery career and adding in more than 30 years of the brightest networking and internet development experienced people you're likely to ever meet. We think you will like the result, we sure do! ARCHIVE screenshot. Click to enlarge. ARCHIVE is built on state of the art Open Source technology, intranet/internet access with security roles and controls for an unlimited number of users is an integral part of the system. Click to enlarge. 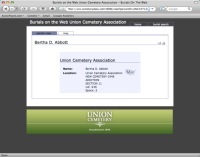 The Burials on the WEB feature is available as a side benefit of using ARCHIVE. BOW for Davids Cemetery, Kettering, Ohio. 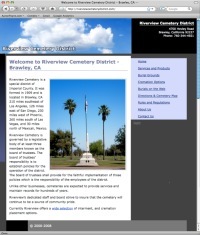 Maps prepared by Cemetery Mapping Services, Inc. integrate directly with the ARCHIVE databases. We have also integrated maps for customers using standard GIS tools. Icing on the cake - the site you're viewing uses our new Web Template. The template is included with ARCHIVE. With a few changes it could be driving your new web site. With some help from us, your pictures and content can be famous.